These U.S. resorts provide numerous activities and supervised kids' clubs, allowing mom and dad to really take a break. NEW YORK ( MainStreet) -- Any parent knows that going on vacation with kids is a major production. Where do you go and what do you bring? How do you keep the little ones entertained? Many resorts in the U.S. are making travel-planning for families just a little easier by providing what children need, from play areas to kids' meals. Even better, these places provide numerous activities and supervised kids' clubs, allowing mom and dad to really take a break. Here are 10 properties in the U.S. with kid-friendly attractions such as water parks and arcades, and lots of perks for parents such as golf and spa treatments. At the African-themed Kalahari in Pocono Manor, Pa., the goal is to not only provide what kids need but give them what they really want all in one place: thrilling rides in a 100,000-square-foot indoor water park, arcade games where tickets won can be exchanged for prizes, and a kid's camp with daily activities from storytelling to cookie-decorating. 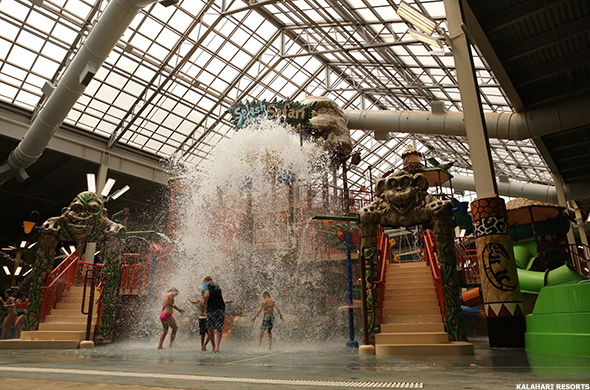 For the big kids, Kalahari's indoor water park offers stand-up surfing or body boarding on the FlowRider and wild waterslides such as the Anaconda and Swahili Swirl. Supervised toddlers and infants can splash around in play areas like Tiko's Watering Hole, while adults get drinks at the Thirsty Turtle Swim-Up bar. 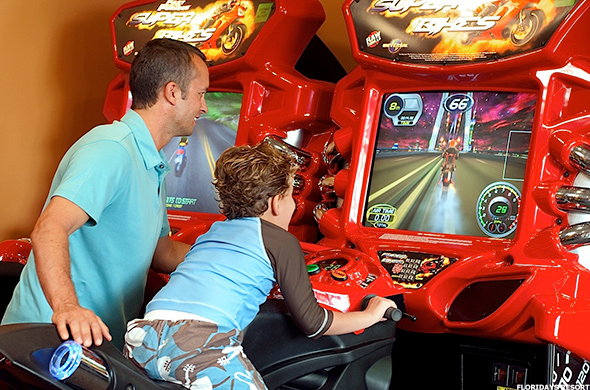 Kids can spend hours in the entertainment center playing arcade games, mini-bowling or backlight mini golf, while mom and dad get spa treatments. 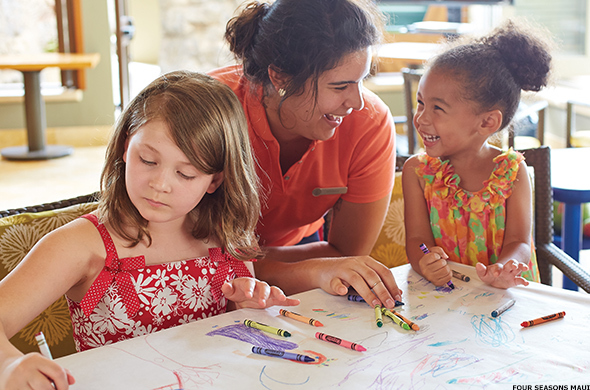 At Camp Kalahari, the resort's activities team will keep kids busy with contests, interactive games and crafts, so mom and dad can go shopping for souvenirs. Named after the desert in southern Africa, Kalahari was inspired by the most recent Africa trip Todd Nelson, owner of Kalahari Resorts and Conventions, took with his family. Many pieces of furniture and artwork have been sourced from six different African countries that the family has visited. Some items sold at Kalahari's retail shops like home decors and jewelry were imported from Africa; Java Manjaro in the lobby serves coffee made from handpicked Rwandan coffee beans. 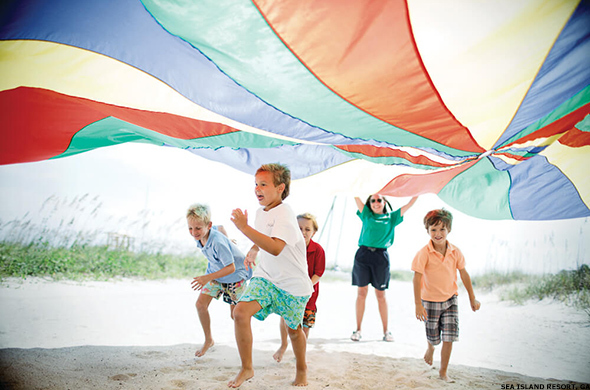 "Our all-under-one-roof getaway offers something fun for kids of every age group," says Nelson. 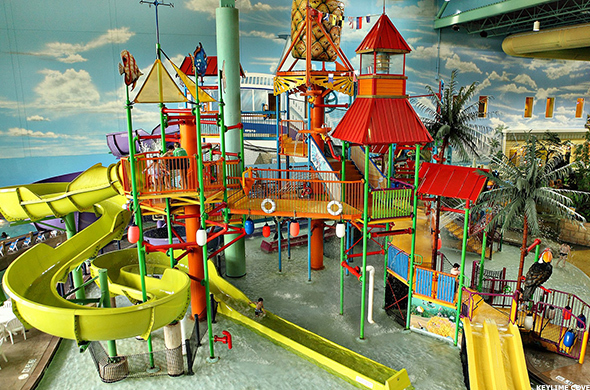 "We also offer a unique experience, not typical of other water parks or resorts. You'll find the spirit of Africa in every corner of Kalahari." Families can spend just a day in the water park, but for those who want to stay longer, guest rooms and suites with up to three bathrooms are available. What about mealtimes? Unlike some family-friendly resorts where jackets are required during dinner, Kalahari's restaurants do not have a dress code. That's one less thing to worry about when packing for your getaway with the kids. Great Karoo Marketplace Buffet has more than enough food stations, and one is dedicated for kids' meals (think macaroni and cheese). 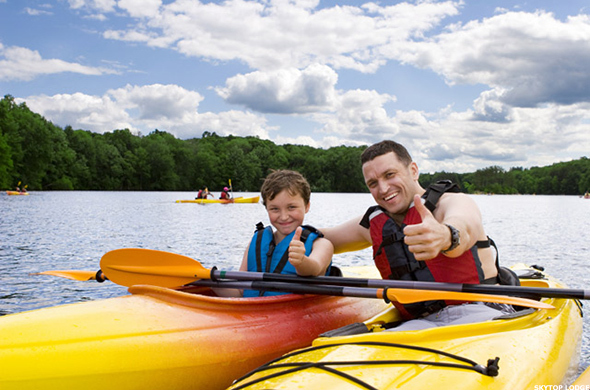 Ready for a summer getaway with the kids? 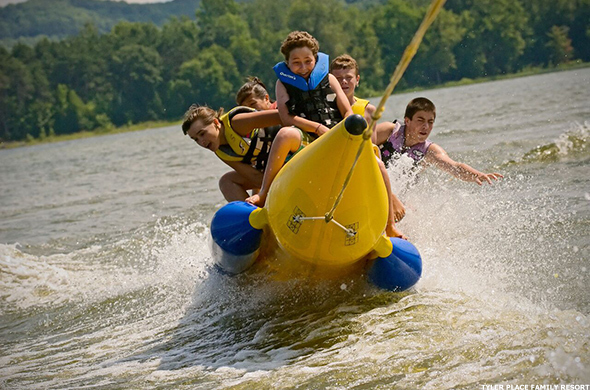 Check out these other resorts in the U.S. that offer fun family activities, child care and kids' camps. Skytop Lodge is in the Poconos, about 93 miles from New York City, and 117 miles from Philadelphia. The Main Lodge and the Inn both offer rooms and suites. Larger families or groups may choose to stay in the four-bedroom Cottages. Smugglers Notch is a popular East Coast ski resort that has also become a popular family destination in the summer months. The resort consists of five different lodging communities with one- to five-bedroom housing options. All condo homes come with a fully equipped kitchen and access to laundry facilities. 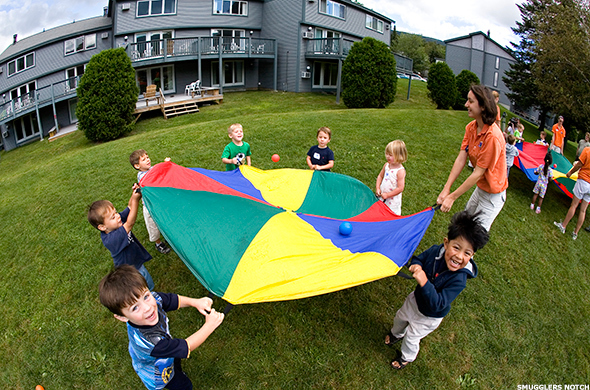 An all-inclusive resort, Tyler Place is located in northern Vermont on a mile of private lake shoreline. Families can choose between suites and private cottages. All suites and cottages include living rooms, screened porches and kitchenettes. Located on the James River between Richmond and Norfolk, Kingsmill Resort is within minutes from Colonial Williamsburg and Busch Gardens. Three-floor condos in villa-like clusters along the banks of the James River feature one- to three-bedroom suites, with kitchens and laundry facilities. KeyLime Cove is less than an hour from both downtown Chicago and Milwaukee. 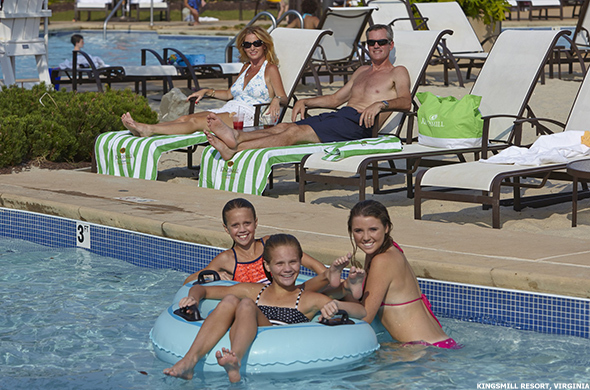 With 414 resort-style guest rooms and suites, the resort provides water park guests with the option to make a day at the park a multiple-day retreat. All rooms include 32" flat screen TVs, complimentary Wi-Fi and admission to the water park. Floridays Resort is 15 minutes from the Orlando International Airport and minutes away from the Disney Resort complex, Sea World and other Orlando attractions. An all-suite condo-style resort, Floridays offers its guests spacious accommodations and a variety of amenities. All suites include a fully equipped kitchen and two bathrooms. Sea Island Resort is located on its own island on the coast of Georgia, 60 miles from Jacksonville and 60 miles from Savannah. At the heart of the resort is the Cloister, the main Mediterranean-style building. Guests can choose from 200 rooms and suites, each with hardwood floors and exposed-beam ceilings. Guests can also choose from 40 guest rooms at The Lodge, the resort's golf club. Homes and condos are available for larger families and groups. Ojai Valley Inn and Spa is located 60 miles north of Los Angeles and 12 miles off the ocean. Vacationers can enjoy 305 deluxe guest rooms, a spa penthouse, an hacienda penthouse, 75 other suites, and a five-bedroom gated residence. Perched on the shores of southwest Maui, the Four Seasons Resort, Maui, boasts inland views of Haleakala Volcano. The Four Seasons has the largest guest rooms and suites on the island of Maui. Rooms are serviced twice a day by the 150-housekeeper staff and each room features a private lanai with ocean, garden or mountain views.